This App is great but it randomly records even though the app is closed. I’ve used this app through out 7 years of band at school. Nough said. Tonal Energy is the total package. I rely on it for tuning my ensembles, myself during practice, and for keeping myself true to tempo when practicing my music. It’s easy to use, and makes a world of difference in my playing, without breaking the bank for an expensive tuner or metronome. When I first got the app I was thinking it was not going to be very good but after the first day it was amazing I was able to complete my violin homework with this app and I was able to tune my violin. This app is amazing!!! I bought this app for my high school marching band and it is the best purchase I have made. It has everything you need, and is very accurate. I would 100% recommend it. I use it everyday, I like the updates. TᕼIᔕ TᑌᑎEᖇ ᑕᗩᑎ ᗪO ᔕO ᗰᑌᑕᕼ IT Iᔕ ᔕO ᑌᔕEᖴᑌᒪ ᗩᑎᗪ ᗩ ᗩᗰᗩᘔIᑎG!!!!! Great for string players. The medium setting is awesome. Highly recommend. When we practice for chair test I use this to make sure I’m hitting every note on point. This app was my favorite, but now there’s so many updates it feels kinda impossible to use. Especially the metronome. It still works but it takes a while to learn how to use everything. This app is amazing, and it helped keep me on beat, show what note came out, and get me tuned. The one thing it does not do is tell me why I keep playing notes 1 step different than they should be. But it wouldn’t be able to do that anyway! Compared to other apps, this one is a no brainer. Pitch pipe, tuner, and a complex metronome. Only thing that I would ask the developer to change would be to update the interface. Make it more modern. Anyways it’s still 100% worth every penny. It is absolutely frustrating and annoying that the pitch wheel decides to jump octaves whenever I press chords in succession. I press down on a chord, release, then press down again (on the same or different chord) and it delivers it in an octave higher. It does this again and again until it peaks out in the 8th octave. There is an option to press for changing of octaves that I am not employing, but nevertheless, the jump from octave to octave is done anyways. Can the octave changes in the pitch-wheel be restricted specifically to when one presses the button for octave change? I would appreciate that enormously and gladly change my 1-Star rating to 5-Star. Thank you. Awesome tuner and metronome app! 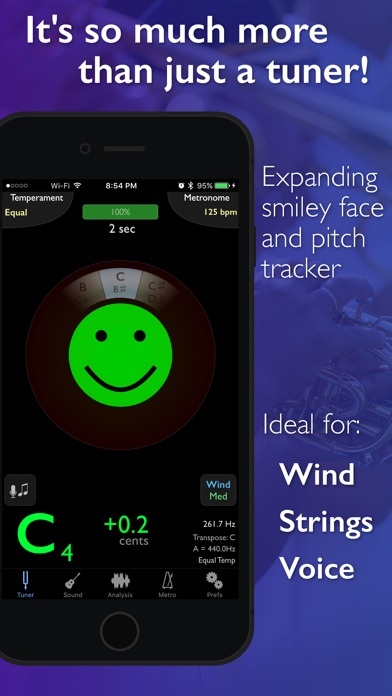 Use the “just” tuning feature to tune wind instrument chords! 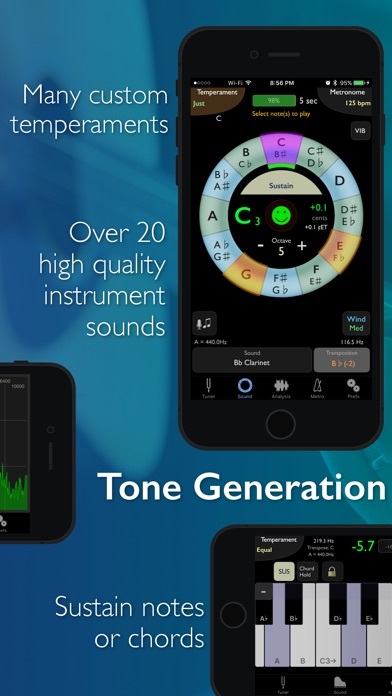 Also the tone generator is great for tuning during a class, before concerts, etc.! Great app, worth the money, but I wish the metronome volume was customizable. This is the best tuner app ever! I use it almost everyday to practice and to learn new songs/scales! It has helped me through so much in the last few weeks! I completely recommend Tonal Energy tuner!! This app is fantastic! Obviously created for musicians by musicians. One suggestion for improvement, add a practice timer and it will be absolutely complete. I use this app everyday and I’m retired! My only suggestion is a pitch wheel or some way to alter pitch on the fly to assist in a presentation I like to do using two devices to demonstrate intonation beats and how to make them smooth out. I love this app because I play two different string instruments and with regular tuners you have to change the settings to match the viola key then back for violin! That’s why I really like this app. so the reason I got this app was my jazz band teacher told everyone in my band to get it. I like the transpose feature, and i’ve even used the app for vocal work. when we practice in sections, the section leader uses a metronome, and this year i'm sure we will be using this again. this app has never failed me and all of my friends love it too. I love this app so much. It is sooooooo much more than a tuner. You must gat this app. Also, is there away to combine recordings on the app? Very confusing to use I am a student who was recommended this app by a teacher I paid four dollars and just can’t figure it out! As a classical musician, this app does it all. Still figuring my way around things so there might be a way to do it, but I’d like to be able to run a few of the different tools at the same time. Fortunately it’s on the App Store so I run it on my tablet and phone at the same time. The Tonal energy app is fantastic! As a band director, I love this app. It helps my kids be motivated about tuning! Hands down great job simple layout yet detailed interactive and A+ results. My lessons teacher made me get this in high school to monitor my clarinet performances and tone. Boy, am I glad she did. This is the best tuning and metronome app I have ever used. It’s consistent, precise, and easy to use. There’s even smiley faces when you are in tune. I love this app. This is a no-nonsense all in one tuner app built from the ground up with unbelievable easy to use features. No matter the which instrument, one plays can be tuned with instrument's sound. This is a must buy. Thanks once again. Everything is great except the metronome has a weird emphasis in the click. I like to keep it in one so the beats are all the same except they’re not and they aren’t consistent either. Great tool for our a cappella group rehearsals both for a unit sound and individual voices....helping everyone stay in tune. I would love if you could implement the watch version using the microphone on Apple Watch, instead of simply as a remote for the iPhone app. Also, if you redesigned the app’s icon as well as replacing the stupid smiley face, I would be pleased! Otherwise this is the best one I’ve used. I LOVE this app, personally being a student playing the violin and have to practice every day for a minimum 30 minutes, this app helps SO much! I saw my teacher using this app and she recommended it. I don’t know how to tune on my own but the money is WELL spent! I am forever great full I couldn’t thank you enough!!!! It’s so worth the $3 it’s an all inclusive tuner!!!! First, let me just say that as a Violinist, this app is extremely helpful to me. I don’t think I could practice without it, hence its #1 ranking in the app store. Since I couldn’t find a feedback section in the app, I just wanted to mention a small issue. When creating metronome playlists, after “Use Tempo” is switched off for all the presets, the entire set does not inherit the tempo set in the header tempo box. Instead, it reverts back to the original tempo of the individual presets. Other than that, it is a really intuitive feature. I think there should be percussion. Like timpani and mallets. Just my 2 cents. This app exceeded my hopes, it's amazing. The realtime visual wave form teaches how the notes look in your ear and show what's going on with the sound and why it's actually impossible for a guitar string to be adjusted to 1/10 of 1 cent as Peterson is selling. I got a Peterson StroboTuner for Christmas $129 on Amazon and sent it back. This app is better. It deserves a user forum. I am using the Peterson Pitch Grabber, with this app. That's a clip on contact mic. When it's plugged in it doesn't cause the audio microphone in my phone to stop working. That's terrible because it picks up all the audible interference. I'm using the app on my Apple 5S which is updated regularly. Help with this issue would be appreciated. A remark to: mtnhorn on his over sensitivity issue. There's a little box that appears when you're in the waveform mode that reads, "time" this seems to be a sampling rate. Over a long span a musical tone generated from its instrument has an excursion that produces a range of frequency throughout its "life". If you are sampling a long time then you'll see the range of frequencies. The only possible tone that can produce what you're looking to see is a pure tone from an electronic tone generator, other than that you would see what you're seeing. But if you can find that time box, touch and hold while you then slide your finger down. You will increase the rate at which the tone is evaluated. Then adjust the kind of report you need which is the "wide," "fine," whatever. Be sure to adjust the input filter which is the "voice," "strings," or "wind." Each kind of input has its own issues. I mean, imagine the human voice being rejected as an inaccurate musical input because it doesn't produce a clean, pure, DEAD tone like a tone oscillator. But by precise filtering the human voice is observable. In the "time" box you'll see that you can set the time sample rate as fast 2/100 of a second. Now watch the report of the note; nice. A note to classical guitar players. Classical strings need patience to live with. You can’t just tune these like steel strings. With this tuner you can see that you have tuned the open string ok but ad you play each note along rage string that some are ok, some flat some sharp. Depending on what key I’m in I can adjust to bring in the notes that I can have the tone and the intonation too. I use the wave form screen the most. Classical guitars strings from brand or model vary a lot. Segovia noted he tuned for the key he was in lest his 3rds and 10ths were sour. Yes that is true, but I wonder if he ever got to analyze the intonation of the notes on a precise machine like TE Tuner. I paid like 4.00 it’s better than anything Peterson offers in guitar tuners. Contact me on twitter if u like. In Consideration@abc_lmnop. This is an absolutely phenomenal tool. You can see and hear the notes, how long you've been in tune, how much you're out of tune, in many instrument sounds. Highly recommend. Great for choir and band students alike. This app is just fantastic! Easy to use, fun to screw around with, and it’s super slick! I recommend it to everyone who loves music. I have set the tuner to A=442, but it clearly is playing A=440. So you can’t import audio from iCloud or gmail? The app was ok it just needs some work because it says my saxophone is out of tune but my band teacher says it is fine🎷🎷. I would recommend it?? Amazing product, I bought thumb piano after getting this, both amazing products, sorry to gush! There are times when I’m recording a video and after I’m done recording I stop it, however, it doesn’t automatically stop like it normally does. Once I click it a few more times, the ‘write a name’ box pops up. That video then doesn’t have audio to it. I love the app. It’s just this small thing that makes my recording assignments take longer than expected and makes things inconvenient. “If you have a smartphone, you have everything you need” This group has the musicians needs at heart. Please support them. These guys are not above your requests. Best tuner and metronome out there by far. Worth the few bucks you pay. As a band director I encourage all my students to get this and have found it to be a huge help to them gaining a better pitch center especially. This app has helped me with my trumpet better than others. My band teacher uses this app during class too. The metronome is also great. I’ve been using this app for years it’s excellent does exactly what I wanted to no-brainer this is the app to use for tuning your instrument. This is a great app and my band directors recommended this for everyone. This app is amazing but it can drain your battery. Crashing problems need to be fixed, otherwise 5 Stars! This app was highly recommended by a friend, he had used it in our vocal rehearsals to give us pitches and tempos. I bought it to try and consolidate all the functions I need in to one app. Initially I found the tuner very jumpy, and I don't like the smiley face with concentric half circles tuning model at all, so I wrote a pretty harsh review. The developer contacted me and pointed out the string tuning mode, which I initially couldn't find because it's not in the tuning section; it's under the sound tab. It makes it much easier to tune my guitar (and it has setting for many stringed instruments from viola to banjo) but if I try to sing long tones or play them on my trumpet, I'm back in the happy face tuner. In theory it should work but to me, the slightest pitch change in a long tone causes the rings to jump erratically. I think that the string mode rescued the app from deletion, and added one star to my rating, but I will still sing and play long tones into the free "pano tuner" rather than deal with the unhappy happy faces. Kudos to the developer for helping me find my way around the app. One more quick gripe, if I'm singing with the metronome playing, the app hears the click and reacts to it, so you essentially can't tune with the metronome on. This is the best tuner and practice buddy I’ve ever purchased. I use it to get my Saxophones in tune. I use it to practice. I use it before I go on stage to perform. Amazing app. The best tuner/metronome app out there! Trombone professor recommended this to me a few years ago and I plug it every chance I get with my friends. Just about everything you could need in a practice session - tuner (with visuals and a happy face! ), metronome, tone generator, and it can record your stuff and tell you how in tune it was. Incredible. Worth much more than the price tag. 5/5 would buy again. Great program! Very easy to use. Love the multitude of features! Great for tuning and intonation practice. To those saying this app shows something is out of tune, compare it to a drone. This app gets you exactly in tune. It’s way more sensitive than any other tuner I’ve ever used. The metronome app is also stellar. So many different features that are ideal for any musician, but it’s especially helpful to band and orchestra classes. This is exactly what you need if you want tangible feedback on how to play in tune and in time! Functions just fine, but iPhone X has been out for a month now and developers have had since September to optimize their apps for the new display. We’re now at the point where I’m beginning to delete unoptimized apps. I love Tonal Energy! It is really easy and convenient to use. I have been playing the cello for about two years and the piano for one and this app has made it easier for me to stay in tune and on the right beat. I love the portable piano on here; when I’m bored it works as a game for me to practice my songs and start making new ones. This really helps me in band! It help me find a beat, tune my flute, and play the guitar! 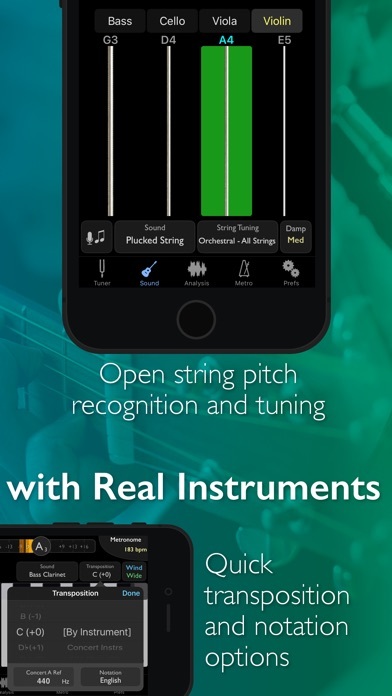 If you are in band or strings you NEED this app! I was unable to get this app. Able to get Solitaire from the App Store. I tried all the fixes including resetting the iPad mini 4. I received confirmation that I was charged from Apple Pay. Very disappointed. I am a beginner musician and this app really does have everything for vocals to instruments! About the only thing it doesn't do is wash cars and fold laundry... my bet is that they'll get that handled in the next version ;) seriously I cannot be more happy with this app. I acquired this app on the recommendation of a fellow colleague who uses it regularly in her studio. I became frustrated with trying to hold a steady pitch (according to the app). I finally set a pure pitch on my oscilloscope and turned on the app. According to the app, my oscilloscope/pitch-generator could not hold a steady pitch. As a tuner, I find this app to be more of a frustration and a distracting discouragement than a help. A good strobe tuner works so much better that I cannot begin to extol the benefits. As far as the other functions on the app, they are very nice, probably overkill in some areas, but as a tuner, I find this more hindering than helpful. Will not act as tuner just as watch. Two sentences on support site about how to use on watch. Kind of want my money back. ON EACH BEAT, THE LIGHT COMES SLIGHTLY AFTER THE SOUND => BIG PROBLEM When the metronome gives a beat, the light comes slightly after what you hear. When practicing, I rely heavily on the light as a visual tracker for the rhythm, and because the metronome does this delay, I’ve been practicing each beat slightly delayed. This is a big problem for a metronome. Other metronome apps on the App Store, such as The Metronome by Soundbrenner, that are certainly not as sophisticated as TE Tuner, don’t have this issue. Please fix this ASAP so that the visual and audible are synced. Meanwhile, I’ll be using other apps for a metronome until this app is fixed. Great App! Please never get ride of the double tap to pick a key in Just Intonation! Tuneable just got rid of this and it is a great feature! I’ve used this as a professional for 3 years now. Love it! Accurate with lots of features. Highly recommended. Really helps me out when I play my saxophone and need a tuner too! This app is so useful to me. I play the Bass Clarinet and every time I practice I take out my phone and tune. TE tuner gives the most precise note value that I've seen, ever. I chose this app for the Pitch Pipe use, because I am a Merrie Olde Christmas Caroler. It has been malfunctioning more and more to the point where I will have to find a new app or return to the analog pitch pipe. It has caused me several moments of professional embarrassment. What is wrong with it? This is my go to practice app. I’m a trombone player and have been very happy with all of the features included in this one app. It’s got everything I need for working on my sound, intonation, time, etc. A great all-in-one app for working on technique. Wonderful program. Wide range of applications. Very easy to use. Tuner is out of tune? I compared the tuner function against multiple korg model timers and found this app to be all over the map with the tuning. Some notes that were in tune on the korg tuners were showing 15 cents flat or sharp!! That is a problem with the app. How can you have a “tuning” app out of tune? I’ll be sticking with the korg. BTW they were both set at 440 UPDATE: I revised my original rating from 2 stars to 5. First because after a great response by the developer I discovered that I had a setting incorrect even though the Hz setting was correct. Second because of the excellent customer service! I never expected Total Energy to read my review but they did and they reacted to make sure I was satisfied. That is rare these days!!! Awesome tuner...I have since retested the App vs. the various Korg model tuners I have and they are all spot on! 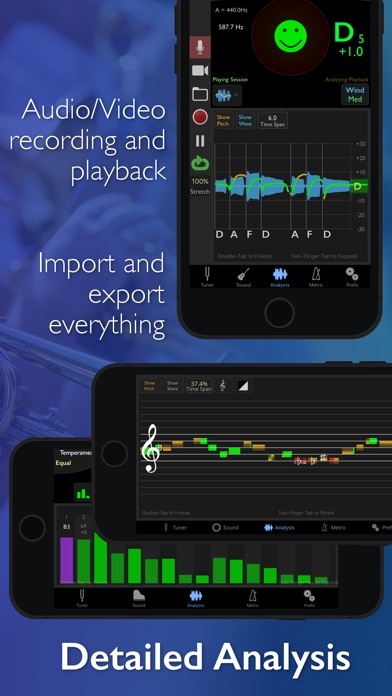 It is a great app with very responsive developers who actually know what can help you tune any instrument efficiently and effectively. I am unanimous in that! My band directors suggested that I should get this tuner and it’s amazing with the iPhone and the Apple Watch! Great set of options. Take time to learn it’s features. Worth the effort. I primarily use the drone and metronome features. Today, when doing scales, I couldn’t get the met to work. It wouldn’t adjust tempo, not that it matters since nothing happened when I pressed play. Reinstalled with same problem. I need something reliable all the time, so I’m deleting the app to have room for another. I’d love to come back to this app if it can work all the time. No app offers greater functionality. This app “coaches” you to be your absolute best! 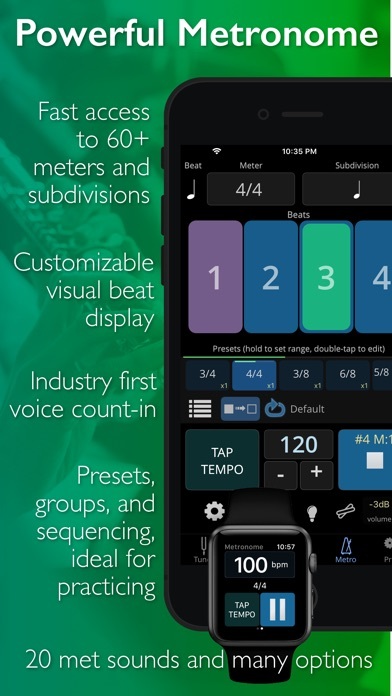 Everything that you could ever want in a tuner/metronome is available in this app. Powerful app. Haven't even discovered all it can do. My students love it as well. Love this app! Can’t recommend it enough. The drone-tones are the best. I am in the 6th grade band and we use it all the time. I really like this for helping me play the flute. I wish it didn’t pick up anything else in the room and only hear the instrument that is trying to be tuned. Overall I enjoy this app very much and if you are one of those people who play and instrument you should defiantly get this app. The app is a good investment for anyone needing a tuner and metronome. My only complaint is with the lack of explanation of the features by the designers. Even if you go to their website, directions are not user friendly. It's little details like the way the buttons pivot between portrait and landscape that show the app designers took their time to do a nice job. This is the best metronome and tuner sold in the Apple store. I have been a professional symphony musician for over 50 years and this is head and shoulders the best music app available. I use it for everything! Must have if your a musician. Best app I’ve ever bought. App gives you som much just for so little. Great with practicing with a instrument. I’ve tried a lot of tuners over the years and this one is by far the best. One of its many advantages is the resolution setting. I have my students tune the open strings at the fine or extra fine setting and then play scales starting with the wide setting and working their way up to finer settings over time. If you buy only one music app, this should be it. Sonosaurus is is constantly updating and is very responsive to customer feedback. Great app. Metronome has improved a lot. Recording feature is very helpful for improvement. One of my best app purchases. If you are any kind of musician this app is the perfect one for you. It enables you to record. It has a tuner and a metronome. All around fantastic! This app has no intonation mercy, requiring < 5 cent deviation from correct pitch to reward one with a green. But looking through the other options allows one to tune to a piano which isn’t, add a metronome, be nagged by playing the correct pitch vs yours, etc. well worth paying for! Very cool idea, but has some bugs. This app is phenomenal. There is only one big improvement that I would love to see happen on the Apple Watch app. I would love to have the capability to have the watch give haptic feedback when I use the metronome. No app does this well. I tried another app and it provides haptic feedback, but the feedback stops when the watch screen goes off. Again, I love every aspect of this application, but I, and the rest of the Apple Watch community, would LOVE to see this be implemented! Hey I love your app I use it every day but your app is not updated for the iPhone X display which is the phone I have, could you update the app to fill the iPhone? It's OK, to me the tuner is unusable. This app was highly recommended by a friend, he had used it in our vocal rehearsals to give us pitches and tempos. I bought it to try and consolidate all the functions I need in to one app, but I find the tuner virtually useless. There are so many tried and true tuner models; the strobe tuner model, the dial that moves left to right, the electric meter that points to center when you're on pitch... Instead of any traditional model, this app gives you upper and lower concentric half circles, with a smiley face that appears if you're in tune. The circles are very touchy and jerky, and disappear quickly, so I find it hard to tune my guitar with it. That makes the app completely useless to me because I still have to switch to my old tuner app to tune up, so why not use my old metronome too. This was a waste of the purchase price for me. The best tuner, period. Amazing features. Great metronome. Metronome, tuner, recorder, loop player, slower downer, and more. This app has it all and it is easy and intuitive to operate. If I have any questions there is a built in manual to answer them. Thanks so much for putting this altogether! I am extremely grateful to the team behind this app. I use it every day in my teaching as a band director. In sectionals and even in some band rehearsals, I project the tuner onto a screen for students to use as a reference. The metronome has become more sophisticated over the years and I have found that to be useful for myself as well, and my primary instrument was percussion, so a versatile metronome is important to me. I have not used the analysis portion of the app much at all but know people who do and find it highly useful. I hope this app will continue to be developed for a long time to come. Thanks to Philip Geiger and the team for putting this together! This app exceeded my hopes, it's amazing. The realtime visual wave form teaches how the notes look in your ear and show what's going on with the sound and why it's actually impossible for a guitar string to be adjusted to 1/10 of 1 cent as Peterson is selling. I got a Peterson StroboTuner for Christmas $129 on Amazon and sent it back. This app is better. It deserves a user forum. I am using the Peterson Pitch Grabber, with this app. That's a clip on contact mic. When it's plugged in it doesn't cause the audio microphone in my phone to stop working. That's terrible because it picks up all the audible interference. I'm using the app on my Apple 5S which is updated regularly. Help with this issue would be appreciated. A remark to: mtnhorn on his over sensitivity issue. There's a little box that appears when you're in the waveform mode that reads, "time" this seems to be a sampling rate. Over a long span a musical tone generated from its instrument has an excursion that produces a range of frequency throughout its "life". If you are sampling a long time then you'll see the range of frequencies. The only possible tone that can produce what you're looking to see is a pure tone from an electronic tone generator, other than that you would see what you're seeing. But if you can find that time box, touch and hold while you then slide your finger down. You will increase the rate at which the tone is evaluated. Then adjust the kind of report you need which is the "wide," "fine," whatever. Be sure to adjust the input filter which is the "voice," "strings," or "wind." Each kind of input has its own issues. I mean, imagine the human voice being rejected as an inaccurate musical input because it doesn't produce a clean, pure, DEAD tone like a tone oscillator. But by precise filtering the human voice is observable. In the "time" box you'll see that you can set the time sample rate as fast 2/100 of a second. Now watch the report of the note; nice. I love this app but it is not utilizing the full screen for iPhoneX. At my school we use this app everyday and everyone in my class loves it. I bought this app hoping I could use my Apple Watch as a tuner, standalone. turns out, this app doesn't offer that functionality -- a phone is necessary for the microphone access. It's possible this is a limitation of the watch? But I am not disappointed. The whole app is beautiful & functional... & the secret sauce is the "analysis" tab. I've never seen anything like it. Any musician should appreciate the ability to watch pitch in real-time. Good work, developers. This app is fantastic. The tuner and metronome work easily together with the drop down menu, and the recording functionality is especially useful for audition preparation. I would recommend it to every musician I know. This app was recommended by all of my music teachers and so far it has yet to disappoint. It's nice to have everything I need in one app that actually works. I've used many tuner apps in the past that have not accurately processed the notes from my flute but this one does easily. This is a necessity for all band kids. I don't know how I'd survive chorus without this tool. Subdividing the beat really helps learn note lengths. Amazingly versatile and complex pitch measurement or simple and easy single instrument tuner, all in one nicely designed app. The same is true of the metronome as well. A great deal and a pleasure to use.